Self-driving cars are displayed at the Google I/O 2018 Conference. Self-driving cars might sound futuristic, but the reality is that they're here and they aren't going away any time soon. Waymo, which got started as a project at Google, is at the forefront of the self-driving car revolution. Waymo has real-world testing underway in dozens of cities and has ambitious plans for a driverless, ride-hailing service. Why is Waymo Developing Self-Driving Cars, and Who Will Use Them? Self-driving cars might sound like a cool concept, but when a technology leaves the "what-if" stage and ends up barreling down the highway right next to you, the casual observer might wonder why, exactly, Waymo is making driverless cars. Who are self-driving cars for, and why would anyone want to use one instead of driving the old-fashioned way? Waymo's stated mission is to "make it easy and safe for people and objects to move around." The basic idea is that some people are really good drivers but a lot of people aren't, and a world full of self-driving cars could potentially be much safer than a world of human drivers. Whether or not that is true, self-driving cars from companies like Waymo can be a tremendous asset to people who can't or won't get a drivers license; people with disabilities that make it difficult or impossible to drive; and elderly people whose failing eyesight or slowing reaction times have rendered them unable to drive safely. Driverless technology could also come in handy in emergency situations. For example, if a driver becomes ill or incapacitated and cannot drive, a vehicle equipped with self-driving technology could take them to safety. Some of the biggest real-world applications for self-driving technology are in moving people and goods from one place to another. The two biggest examples are in ride-hailing services and delivery services, where the tremendous expense of the technology can be offset by the savings from not having to pay human drivers. In fact, Waymo's own driverless ride-hailing service entered a testing phase in 2017. Waymo has testing locations in California, Texas, Washington, Georgia, Michigan, and Arizona, with the most extensive testing taking place in Arizona. Ultimately, the availability of Waymo hinges entirely on the laws that govern self-driving cars, so driverless cars will only be available in locations where it is actually legal to operate them. Some of the friendliest laws for self-driving cars are in Arizona. This is currently the only place that you can take a ride in a Waymo car. Waymo kicked off its Early Rider program in Chandler, AZ in 2017, and members of the program are able to request a ride from Waymo to school, work, the grocery store, and other common destinations. Waymo plans on expanding its ride-hailing service to the general public in Phoenix by the end of 2018. Self-driving car enthusiasts in other areas will have to wait. What is Waymo, and Where Did it Come From? Waymo got started in 2009 as the Google Self-Driving Car Project and was spun off as a subsidiary of Google's own parent company Alphabet, Inc in 2016. Prior to the split, the Self-Driving Car Project was responsible for many of the most important firsts in the world of driverless cars. In 2012, Waymo's predecessor received the first-ever license for a self-driving car, when a heavily modified Toyota Prius received permission to drive on Nevada roads. Nevada's state laws at the time required an emergency backup driver behind the wheel at all times, along with a second person in the passenger seat of every driverless car. The groundbreaking legislation opened the door for real world testing of Google's self-driving technology. Between 2012 and Google's 2018 IO conference, vehicles powered by Google and Waymo's driverless technology racked up over six million miles on public roads. By 2017, Waymo was able to send its driverless cars out on Arizona roads without safety drivers. Arizona was also the site of Waymo's first semi-public driverless ride-hailing tests. The test was initially centered around the Phoenix suburb of Chandler, AZ, with plans to expand, and it was only made available to members of Waymo's Early Rider program. With the Early Rider program as its example, Waymo's goal is to offer a driverless, ride-hailing service everywhere that legislation actually allows self-driving cars to operate. What is a Waymo Car? Waymo is positioned more as a self-driving technology company than a self-driving car company. That means Waymo is more interested in developing and implementing self-driving technology than in engineering and building cars from the ground up. Google's Firefly prototype, which looks like a cross between a Volkswagen New Beetle and a GEM car, was an exception to this philosophy. The Firefly was designed exclusively for self-driving technology without a steering wheel, brake or gas pedals, or traditional controls of any kind. The Firefly prototype showed us what a driverless car future could look like, but Waymo left it behind and went in a more traditional direction. Waymo's fleet of self-driving cars consists entirely of production model cars that are heavily modified with self-driving technology. 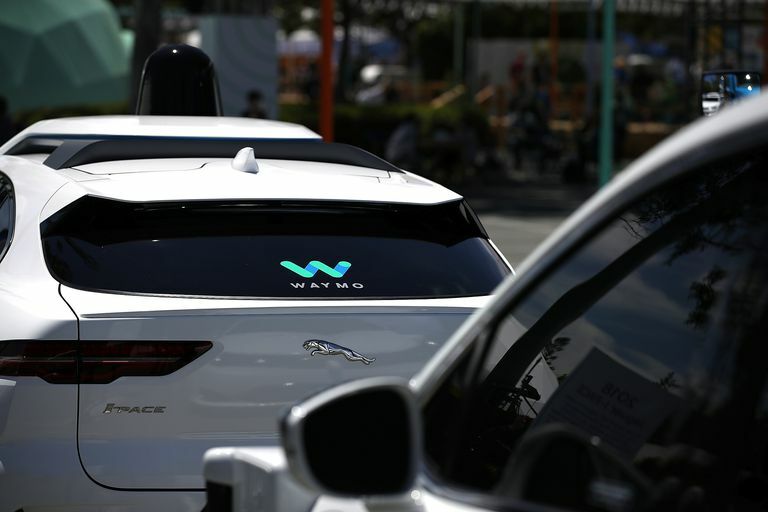 The two models that Waymo identified for its initial driverless fleet were the Chrysler Pacifica and the Jaguar I-Pace. Waymo worked closely with Chrysler to design a Pacifica minivan that would mesh well with driverless technology, and the I-Pace is Jaguar's first all-electric crossover SUV. At a very basic level, the technology behind Waymo's driverless cars is straightforward. Each Waymo car relies on highly accurate maps of the area in which it is allowed to drive. The map is accurate to a margin of error of about one inch. It includes precise information about road layout, stop signs, traffic signals, and everything else required for a self-driving car. Since real world conditions can't be predicted by even the most precise maps, each Waymo car is also equipped with a LIDAR system. LIDAR is technology that uses lasers to generate a highly accurate representation of the area around a self-driving car. Unlike a human driver, LIDAR is able to generate a complete 360 degree view of the world around a Waymo car. A Waymo car is able to plot a course from one location to another and then react, in real time, to the flow of traffic, using the information from maps, the LIDAR system, and other sensors. Self-driving cars also rely on a lot of the same type of drive-by-wire technology that you can find in newer cars. For instance, a self-driving car uses expensive LIDAR to generate a picture of its surroundings, but it relies on brake-by-wire technology to slow down, electronic throttle control to accelerate, and steer-by-wire technology to turn. All of these technologies are controlled by onboard computers. The technology in Waymo cars allows for totally autonomous operation, but the laws in many areas still require driverless cars to have safety drivers. In these areas, the safety driver has to sit behind the wheel and switch it into manual mode when the situation requires. This is called disengagement, and Waymo claims to have a relatively low rate of disengagement. In the reporting period that ended November 2017, the company reported .18 incidences of disengagement per thousand miles driven.